Bess Ficarra is a Gemological Institute of America Diamonds Graduate, one of the highest levels of credentials in the jewelry industry, and is fully qualified to provide appraisals for insurance or other purposes. Your appraisal can be done in your presence, if you make an appointment, and you will be presented with two printed copies of each appraisal. Whether it's an engagement band, diamond wedding ring, or the antique jewelry collection of your great aunt's estate, Ficarra Jewelers can help. 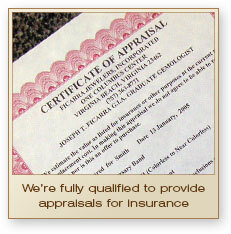 We can identify, classify, and appraise it for market value, for insurance, or for liquidation. Want to know what it's worth? Come in to our showroom and have the value and quality of your jewelry verified.